Storm: Thanks for tuning in for the final installment of the Van Halen style series. This lesson feature more rhythm guitar in Eddie Van Halen's hard rock style and a solo with several licks. Here are the chords for this jam track, in the Key of E.
Storm: And a tab of the Rhythm Guitar part. Storm: Notice the use of single notes from the chords, the major and minor pentatonic scales to connect each bar. Our first lick, Eddie's "Elephant" sound. Another 'neat noise'. and an attention getter! Storm: Turn the volume down hit the three harmonics shown then depress your whammy. Now roll up the volume as you raise the whammy bar. 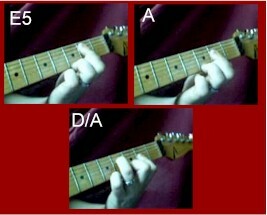 The second lick uses a tap in the right hand of a note bent in the left hand. Release the bend and re-bend between taps. Ending with a pull-off. Storm: Now the third lick, and we're starting to work up a sweat. Storm: This is a legato, two hammer-on, hammer-on/pull-off phrase. In the three note per string pattern that Eddie favors. Also uses the open string pull-off to make a position change. This next riff taps out notes of the E minor pentatonic scale. The same pattern moves between strings 1 and 2. Storm: The next two riffs uses the whammy bar again. The first uses harmonics. Starting with the 4th string, 5th fret. Depress the bar, then pick the harmonic to 'swoop' up to pitch. The next is at the 3rd string 6th fret. A difficult harmonic to pull out. Eddie's "Horse Whinny" sound. You then dive the bar. Finally fret the 12th fret, 1st string. No tab, just the video. The next tab uses bar dips on each new note. Storm: You might recognize the next lick. This lick double-picks each note and produces a classical type sound. Storm: This next lick continues from the previous lick. Notice how you descend the scale pattern while double-picking each note. You end by playing a pull-off on the open, 1st and 3rd frets. Storm: This next lick uses a basic pull-off pattern. Storm: This next lick starts by tapping the taps 9th fret on the 2nd and 4th strings, then you play notes on the 7th fret on the 3rd and 5th strings. This lick is a little tricky. You later shift the lick to the 12th and 14th frets, and later to the 17th and 19th frets. Storm: Well this concludes our lesson. I hope you learned a lot in this series.